In a cavern of hell, dark and strange creatures cavort for the Devil's amusement. After feeding one of his minions to Cerberus, he chases after another who flees. His Evilness is outwitted in the end, consumed in the fires of his own abode. "Hell's Bells" is something of a favorite of mine, mainly because it's so weird. Down in the caverns of Hades all manner of devilish creatures make merry to Carl Stalling's orchestrations of Funeral March of a Marionette (best known as the theme from Alfred Hitchcock Presents). Disney seemed to go for the spookiness in 1929. Other shorts released around this time include dancing skeletons, haunted houses, and mad scientists. Things get very bizarre and silly in this one, as Iwerks lets his imagination roam with character design and some of the animation gags. For example, there's a wonderful moment when a serpentine beast swallows a bat-like beast, prompting it to sprout wings and fly away. This is the kind of thing that can only be done in animation; the stuff of dreams and nightmares. But despite the fact we're in hell this time, it's still lots of fun. We get an appearance from Cerberus, the three-headed hellhound, but here he's designed in a scrawny and funny sort of way. It's not threatening; it's just weird and funny. There's one moment that makes me laugh every time I watch it, and that's when the third devil walks into the wall. It's an unexpected laugh. But what tops it is the way he becomes all angular after colliding with the jagged edge of the wall. And after all his geometric contorting to retain his original form, he walks right into the wall again. It gets me every time. The absurdity takes one step further as the cartoon progresses. Where else would you witness a dragon-cow being milked for fire? The idea seems to spring from the mind of a five-year-old. Disney doesn't do bizarre things like this so often, but the results here are joyous. 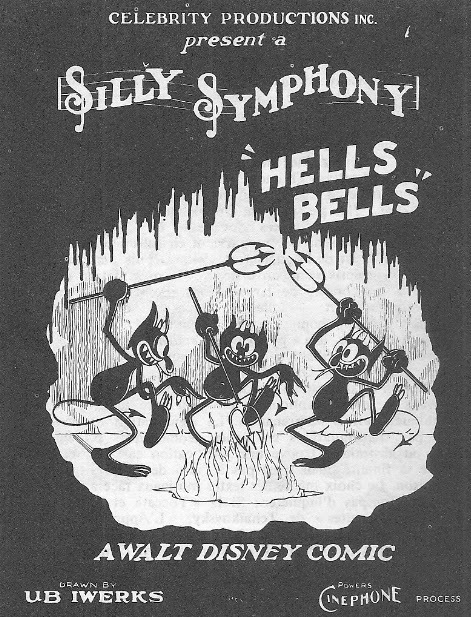 "Hell's Bells" is notable for furthering the formula of what the Silly Symphonies would become. If the pattern of a dance number in an atmospheric cartoon was established by "The Skeleton Dance", "Hell's Bells" takes it one step further by adding to the mostly plotless proceedings a final chase scene. Nearly every Silly Symphony to follow for the next few years would climax in some sort of chase. In this case, it's the Devil chasing one of his minions to the strains of Grieg's In the Hall of the Mountain King.) Like "The Skeleton Dance", the short prefigures much of what would become the story for the "Night on Bald Mountain" sequence of Fantasia. In both, weird infernal beings cavort for the amusement of their dark lord, only to be pawns for his wrath and pleasure. In this case, some sort of good still wins out even though the hero of the chase is a demon, and Satan gets it in the end. Literally. The cartoon opens and closes with a rising wall of flame, coming from the bottom of the screen. It is a sort of reverse curtain call, for just as the curtain would rise on the stage at the start ofa play and fall at the end, it acts in the opposite way in the bowels of Hades. I find it a clever way to open and close the short. As with "Plane Crazy", Iwerks shows his deftness with bringing the audience into the cartoon world.